Product prices and availability are accurate as of 2019-04-22 07:00:22 UTC and are subject to change. Any price and availability information displayed on http://www.amazon.co.uk/ at the time of purchase will apply to the purchase of this product. Light and breezy, these 2-in-1 shorts are flexible enough for nearly any activity in or out of the water; made from elastic, fast-drying 92% Polyester + 8% Spandex surface. 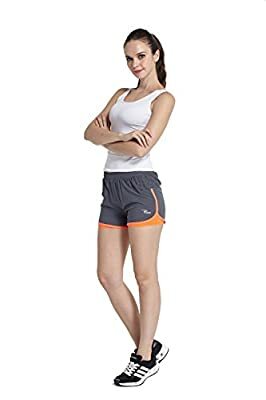 Take your trail going to the next level in these breathable, 3-inch shorts including an ultralight woven external shell and a fast dry stretch-knit liner that provides anti-abrasion coverage. Above size for manual tile measurement, due to individual measurement method is different, there maybe 0.5-1.5 inch error of the physical.